Community Outreach for the underprivileged children in the local villages. These churches gave comfort and refuge when we had no place to lay our heads and close our eyes. It is Cam Ranh Orphans desire to lend a hand to these churches’ outreach programs to reach the local impoverished children. Your donation enables the churches to purchase gifts during Christmas time for families to experience God’s love. Ha Xuan Nguyen Scholarship for underprivileged students from grade 1-12. Named in honor of our "father" who loved all his children, this scholarship provides yearly stipend for books, food, and clothing so the children will have an opportunity to attend school. Without your support these children would not have an opportunity to attend class due to the financial burden on their families. For just $10 a month, your donation of $120 would support one student for the entire school year. Thousands of Vietnamese children grow up in the coastal towns of Cambodia with no future. They have no status—not citizens of Cambodia and no longer accepted as citizens of Vietnam. Because they are poor they have no opportunity for education or chance to better themselves in life. 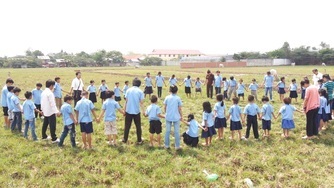 Through the generous gifts of Co Xuan and a number of Cam Ranh orphan families, a piece of land has been bought and a school building is under construction.